Table Rock Lake—located about 20 minutes from Branson, Missouri—offers tremendous opportunities for watercraft aficionados. With approximately 45,000 surface acres and 800 miles of shoreline, captains of all boat sizes and interests will find Table Rock to be a diverse ecosystem with spectacular scenery and clean, clear water. Whether you rent, tow or stow in a marina, knowing what to expect will ensure an easy, breezy cruise. Tributary rivers from both Missouri and Arkansas feed into the sprawling lake, creating a freshwater paradise. The White, James and Kings rivers are the primary watersheds that flow into the lake, which means that on a boat is the best place to be. If that’s not enough, unlimited boating adventures also await on nearby waterways, including Long Creek, flowing from the south out of Arkansas, and Roaring River, flowing from the northwest out of Roaring River State Park. Ready to slip in? Follow the below hints and insider tricks to become a pro at Table Rock Lake’s waterways. Table Rock Lake offers boaters the opportunity to simply find a quiet cove to “chill out,” cruise some 70 miles upstream from the dam to explore the magnificent lake, and everything in between. GPS navigational systems help you find, and waypoint, your favorite spots. That being said, experienced boaters can become temporarily “lost” among the hundreds of coves and pockets, many of which look quite similar. Store a detailed lake map on your vessel for backup, and if possible, chart your course of exploration before heading out on the water. The lake is managed by the U.S. Army Corps of Engineers, which has conveniently placed mile markers along the waterway to help you determine your location. Keep an eye out for these and make mental notes of the surrounding landscape. Although you’ll find many days when it seems as though you are the only boat on the water, the lake can, at times, get a significant amount of boat traffic. Learn and follow navigation rules so everyone can enjoy the lake with a maximum fun factor. This includes slowing down near other boats—especially when folks are in the water—and community docks that dot the shoreline. 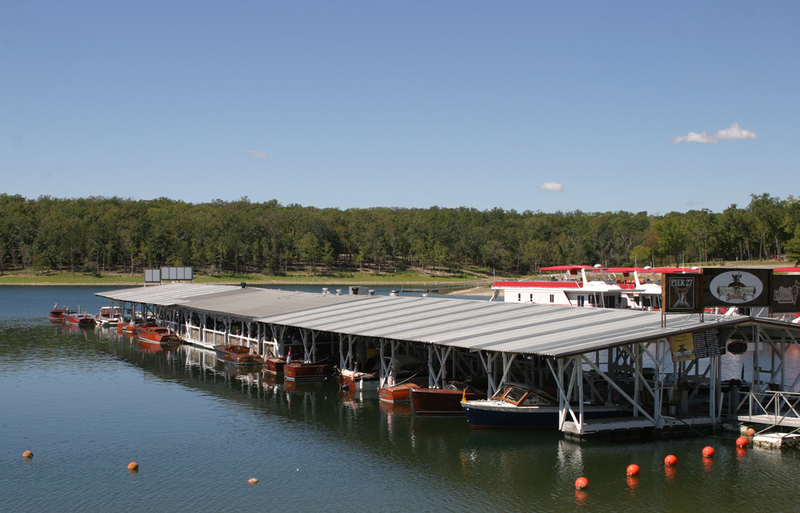 Gas, food, and shelter Table Rock Lake has excellent access points for boaters, including 24 public boat ramps around the lake. There are also 14 public marinas where you may purchase gas, food, and other supplies for your day on the water. Most of the marinas offer extended hours from late spring until early fall, but keep in mind that hours of operation may be limited from October through April. Call ahead before visiting these facilities. You don’t want to pull up with an empty tank only to find it closed (trust me, I know from personal experience on this one). Unlike some heavily developed lakes, Table Rock is restricted on commercial development along the shoreline, so you won’t find a lot of boat-up dining establishments. Many visitors find this to be a plus, as it helps maintain the natural beauty of the lake. However, there are still several excellent restaurants accessible by water—some in conjunction with the marinas. The lake is fortunate to have excellent lakefront resorts offering a rustic or lush (take your pick) home base for your boating adventures. Check out the Table Rock Lake Chamber of Commerce Vacation Guide lodging grid to determine which best fits your needs. Many have private launch ramps and offer slip rental for your watercraft. For those who want to experience the lake, but don’t own a boat or want to tow theirs to the lake, have no fear. Great boat rental options exist. Most of the marinas and lakefront resorts offer daily rentals, so everyone can enjoy the incredible vistas of this family-friendly lake. It bears repeating: always obey state boating laws and have the proper flotation devices on board and accessible. You should have a first-aid kit along with some blankets, and perhaps, a change of clothes (or at least stow a few extra T-shirts and sweaters from fall to spring). Your cellphone might not work everywhere on the lake, so consider investing in a marine radio. You can buy a handheld floating marine radio for less than $100 and it might just save your life. You’ll be able to access channel 16 (official emergency channel) to seek fast help whenever needed. Boat-to-boat and other communications should be directed to another channel. If possible, get a marine radio with NOAA weather alert capabilities. Storms can pop up out of nowhere in the Ozark Mountains, so pay attention to weather alerts and head for shore if severe weather threatens. 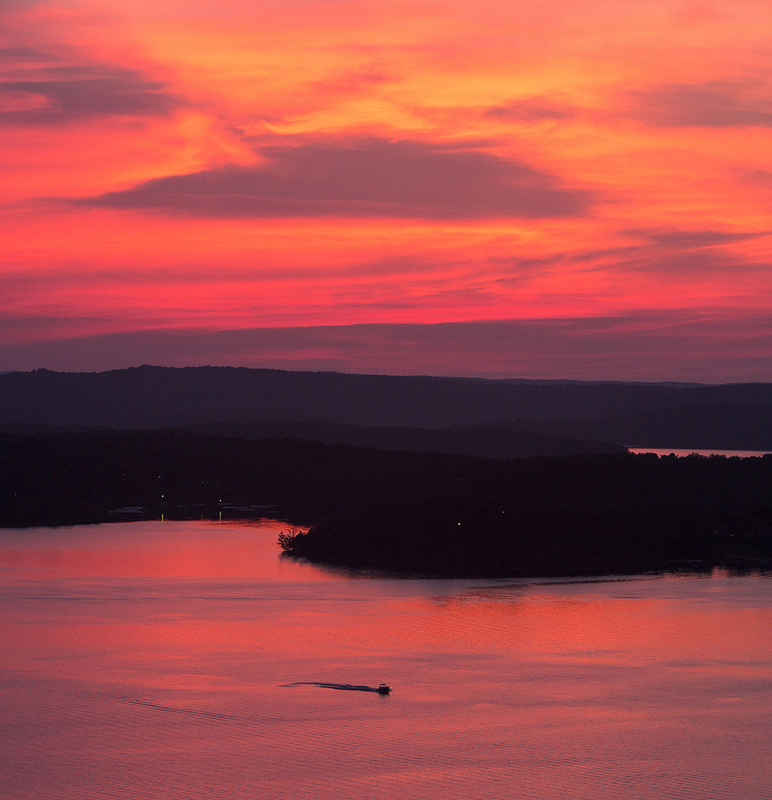 If you’re looking for natural beauty, clear water, and many compelling places to explore, visit Table Rock Lake. Whether you enjoy cruising in a cuddy cabin, cove-hopping in a pontoon, chasing bass in a fishing boat, wake surfing or paddling around in a kayak, just splash your vessel into the water and go.